There are certain mysteries in life that simply elude me - the pyramids, crop circles, Kardashian celebrities. Most of the time I just shrug and move on but today's puzzle has me stymied. Why, I ask you, can a person be in BFE (bum f*** Egypt) for almost a week, in a remote location with less than spotty cell phone reception and not spot ONE FREAKIN' SNAKE and yet, return home to find this in the feed bin with the oats . . . 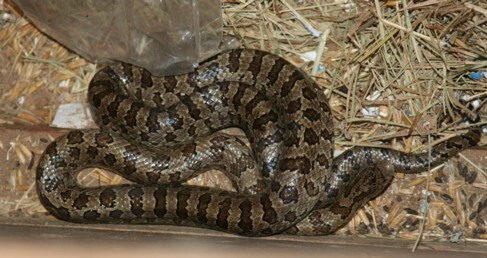 Since we have a mouse problem in the barn and Nadine is a Rat Snake (I think! ), she can stay. Unfortunately she is STILL camped in the feed bin, with at least six mice, so the horses will NOT be getting oats any time soon. I threw them hay this morning and advised them to be happy with it! I'll have to feed them out of a trash can until Nadine moves on. She has already eaten one, but it'll probably take her a while to go through the entire Stuart Little Family. Nadine showed up yesterday. It boggled my mind that I spent almost a week looking for rattlesnakes at the ranch and saw nothing. I am NOT complaining. In no way, shape or form, am I COMPLAINING! Our neighbors 21 miles away found 5 rattlesnakes this weekend alone! Truthfully though, unless he was poisonous, he'd have been safe too, because although I dislike snakes and they give me the willies, they 'do' have a place in the circle of life and I respect that. On the other hand, poisonous snakes are not given such latitude. So there it is, two snakes in two days - 45 minutes from the Big City. (shudder) I swear I heard the theme from JAWS this morning when I saw that snake in the yard. All I'm sayin' is that you shouldn't scare people who carry shotguns. I'm just sayin'. A few years ago my boyfriend and I went camping in the Adirondaks. We drove into the wilderness for hours and then had to backpack 12 hours to get to the campsite. We were there for 5 days and never saw so much as a White-Tail Deer. When we finally returned to civiliztion and were driving into town, past a golf course, I looked over and the biggest bull moose ever was ambling across the golf course. The funniest part was that there was a little old man practicing his golf swing, the moose passed within 10 feet of the guy and he NEVER NOTICED. Snakes! Sigh - I suppose you'll have to practice living in snake country by carrying your gun when you go out in the mornings. Just think of it as a prelude to living at the new ranch. The question you have now is: which is worse - snakes or rodents in the barn? Pros (?) and cons of each: Mice aren't scary ... well, not to most people - there may be exceptions (hahahaha). They eat barn food (oats?) and could infect the oats with their feces; therefore you need to get rid of them. Snakes: scary things!!! Could harm other animals besides mice (? ), maybe. Obviously, I don't like either snakes or rodents. Bleeech! Bring on Lily for the mice, your gun for the snake. Problem solved. Since it's harder to be scared of something I've named, I named the snake "Nadine." Grandbaby #1 has decided that it should be named "Daisy." Thus, the snake is now named "Daisy Nadine." If it is a male, I fear he will develop a complex. Please tell me you've looked into having the dogs 'snake broke'? Or that they have been? I do not live in snake country (thank God and foresight on my ancestors) but have friends that do, and snake avoidance training is real high on their priority list (like right up there with breathing). Snakes are highly effective in clearing out the vermin and as long as they are non-venomous they are a great addition to a farm.